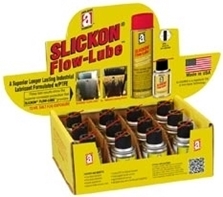 SLICKON® FLOW-LUBE™ is an industrial lubricant ideal for preventative and corrective maintenance that will keep equipment in service longer and reduce costly breakdowns caused by worn and soiled parts. Unique coating action fills in surface irregularities with a combination of premium petroleum oils, micronized PTFE, and extreme pressure additives which act to keep the PTFE in place for long-lasting lubrication. Applications: Bearings, cables, nuts and bolts, air and electric power tools, ball and socket joints, control cables, conveyors, cutting tools, drive chains, gears, glides, hinges, linkages, taps, dies, and more. 360 degree spray valves on cans for those hard to reach places.